Wired UK launches early 2009 - but will it work second time around? Magazine publisher Condé Nast announced this week it is to publish a UK version of Wired magazine next year, along with an accompanying Wired UK website. 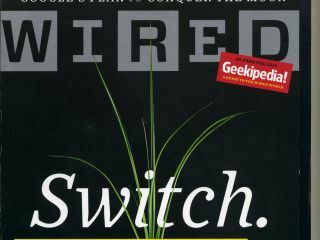 Wired was bought by Condé Nast in 1998, having been something of a success story in the US since it launched in San Francisco in 1993, appealing to what it identified as a growing group of affluent, highly tech-literate 'digerati' readers (or 'technorati' readers – depending on your preference). The original Wired UK – a result of a partnership between Wired and Guardian Media Group - was unceremoniously shut-down back in 1997. The mid-1990s UK version of the magazine proved to be considerably less of a success than in US cousin, having lost around £2 million over the course of its short-lived two year lifespan. The first UK edition of Condé Nast's new Wired UK will go on sale in the first half of 2009, shortly after the launch of an Italian edition. Wired UK is to be edited by the current editor of the Jewish Chronicle, David Rowan, who also writes a tech column in the The Times Saturday magazine and was a previous editor of GuardianUnlimited. "Wired is the market-leading magazine about how technology is changing the world; a highly influential and visionary title that explores ideas and innovation, culture, politics and business, and how technology impacts on contemporary civilisation," says Nicholas Coleridge, managing director of Condé Nast. Bobbie Johnson in today's Guardian notes that you can read all about why one of the first editorial staffers from Wired UK, Danny O'Brien felt that project failed as spectacularly as it did in O'Brien's rather warts-and-all confessional. TechRadar contacted the new editor of Wired UK, David Rowan, who told us that the reason he felt the first Wired UK magazine venture failed was because: "The Guardian/Wired joint venture in the mid-1990s was ahead of its time. No Google yet, no iPods…and just a fraction of the innovation now coming out of Europe. "You could say it was a whole other millennium. But today, look how far technology is shaping every aspect of our lives, from the way we date to the way we solve crime. It's the right time for Wired UK as the magazine that will keep readers a step ahead of the trends." TechRadar's own editor-in-chief, Nick Merritt, gave us his own opinion on the history and potential future of a UK edition of Wired, telling us: "I am a fan of US Wired, and it'll be interesting to see whether its West-Coast techno-evangelism will work as well in the more sceptical UK. "It'll be hard to make it as indispensable as the US one, given the UK's continuing lack of a strong indigenous tech scene. But any new tech mag has to be welcomed and I admire them for trying to shake things up." TechRadar has also contacted Wired UK publishing director, Jamie Bill (currently publishing director of Condé Nast's flagship mens' lifestyle title GQ) for further information on their plans to establish Wired UK in 2009, so stay tuned for updates.